Artist-curators Jonathan Gonzalez, Zavé Martohardjono, and EmmaGrace Skove-Epes approach Movement Research’s Fall Festival by considering collective practices and the workings of collectivity amidst economies of individualism in this current moment. Comprised of performances, workshops, and gatherings led by collectives, invisible material ponders interventions of unfolding in the fold, meandering and mess-making, and coordinating in the in-between. Visit the schedule tab for the full festival lineup, and the curatorial statement tab to read about the curators vision. All festival locations are wheelchair accessible. For more information or if you require reasonable accommodation please contact Anna Adams Stark at [email protected] or call 212-598-0551 (voice only). Jonathan and EmmaGrace were featured on a live stream by Artists Space, speaking about the curation of Festival Fall 2017: invisible material. Find out more by listening to Maintaining Good Relationships: Starting from Zero, starting at 18 minutes. These workshops are not curated by the Movement Research Festival Fall 2017: invisible material, but in the spirit of collective wellness, the curators recommend all Festival attendees visit! 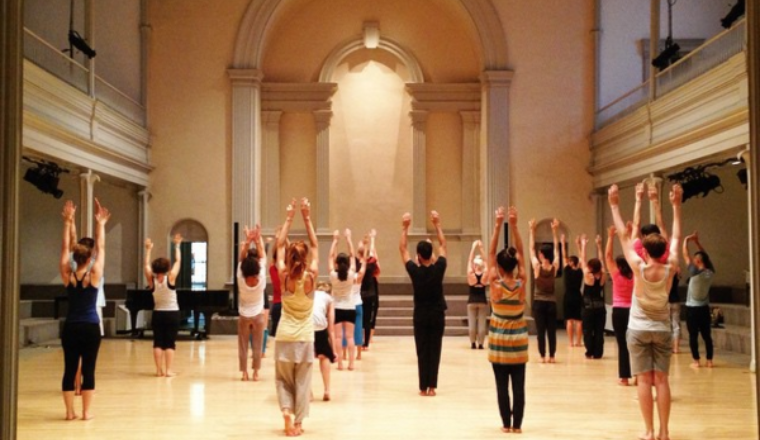 Throughout the festival week, visit MINKA -- a center for wellness and an inclusive environment in Brooklyn -- for sliding scale community workshops in different healing practices. Maria Bauman, Sarita Covington, and Nathan Trice, the co-founders of Artists Co-Creating Real Equity (ACRE), share a platform collectively devised by ACRE members, focusing on racial equity in arts education, funding, coverage in media, curation, casting, and in space allocation/availability, through which they will help participants examine their own artistic practices and artistic organizations with a racial justice lens informed by The People’s Institute for Survival and Beyond. Skeleton Architecture is a vessel of Black womyn and gender nonconforming artists rooted in the rigor and power of the collective in practice. We create, organize, advocate, gather, curate, perform, play, challenge, and teach through the depth of our ancestral knowledges toward the liberated future of our worlds. Our members are Maria Bauman, Sidra Bell, Davalois Fearon, Marjani Forté-Saunders, Melanie Greene, Kayla Hamilton, Jasmine Hearn, Marguerite Hemmings, Nia Love, Paloma McGregor, Sydnie L. Mosley, Rakiya Orange, Grace Osbourne, Leslie Parker, Angie Pittman, Samantha Speis, Charmaine Warren, Marýa Wethers, and Ni'Ja Whitson. Note: One of our core values is prioritizing the "us" versus our productivity. Thanks to you and to all of our supporters, ancestral and present, for being a witness to us and our process. For this event Skeleton Architecture is in partnership with Caribbean Cultural Center African Diaspora Institute, who is working directly with cultural organizations in Loriza of Puerto Rico, Barbuda, Antigua and St. Croix for hurricane relief. The CCCADI, in partnership with our communities, is wholeheartedly committed to action in this moment of crisis. It is our duty to contribute to relief and recovery efforts and to support our brothers, sisters, families, and communities in the Caribbean. "Hurricanes Irma and Maria have had a devastating impact on the islands that are our root homes. It is our duty, it is our obligation, it is our responsibility to reach out to our communities in this time of dire need. The Caribbean Cultural Center African Diaspora Institute is committed to raising resources to be equally divided amongst on the ground community cultural institutions working with the most vulnerable communities requiring immediate assistance in Puerto Rico, Dominican Republic, St. Croix, and St. Thomas. I know that our sacred communities, friends, and neighbors are all committed to assisting. Give what you can in whatever ways you are able to. Remember to be generous. Today, our friends and families on the islands are affected. Tomorrow, it could be us. Please make the effort to contribute what you can. It is our humanity, our love of others, and our devotion to family and friends that have provided the resilience and power to sustain. Let us continue to demonstrate the very kindness that binds us in this moment." After developing mayday heyday parfait for the last 3 years, The Commons Choir reconfigured itself with the intention to unearth their process with the audience in regard to the following concerns. The backstory is The Age of Discovery: da Gama and Columbus sailing in opposite directions in search of the same spice (nutmeg) setting into motion a global interchange of people, crops, livestock, ideas and communicable diseases under the most exploitive terms imaginable. Although this ongoing momentum is coextensive with our extinction, we still have not put in place a counteractive Age of Undiscovery. For the Movement Research event/festival, we’d like to open up our process and problem set to directly address the audience with questions such as: Is divisive speech ever free speech? How could something or someone possibly be out of place? Is “peopling” of the planet potentially out of place? Is identifying with identity the problem? What happens when language is reduced to pragmatics, syntax, self-expression and merely what words can say? Without a practice of ecstasy (standing outside oneself, ek-‘out’ + histanai ‘to place’) will we only reinforce the harmful systems we intend to change? If 70% of domestic terrorist attacks are carried out by individuals acting alone, is singularity the enemy? What do your enemies believe about you? If we stopped arguing, would it solve the problems we’re arguing about? We’re in New York because beaver pelts could be felted to make waterproof hats in Europe. Are you more different from your group than mine? Shall we all meet all over again, free of transaction? The Commons Choir is a variable group of people gathering around concerns that are addressed collectively. The work-to-be-done takes different forms, from discussions to educational programs to interventions to presenting performances. The work, to put it simply, is about who we are as we work together, placed in resonance with you. It’s not a choreography, play, score or improvisation per-se, though it involves all these components. 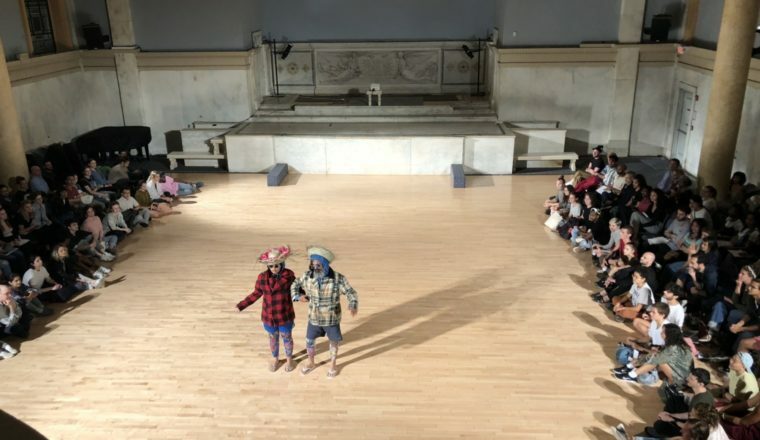 Collective States decided to focus their efforts in support of Santuario(s) - a space created by performances of immigrant artists whose first language is not English. To learn more about Santuario(s), please visit: santuarios.weebly.com. What happens when labor evaluates its own worth? 1. Every participant must have a solo. 2. There must be an element of exhaustion. 3. There must be an element of repetition. 4. There must be a cycle of 8 minute studies. Thanks Jonathan Gonzalez and Movement Research for the support! BAX's Youth Education Programs are generously supported in part by the New York State Council on the Arts, NYC Department of Cultural Affairs, Bay and Paul Foundations, Sterling Bank, Park Slope Civic Council and our many individual supporters. Thank you to the BAX's DPW families for recognizing your children's unique artistic gifts, for supporting them in their wholeness, and for being such an important part of the greater BAX community. BAX exists because of you and your commitment to performing arts and arts education as a vital way to connect and transform individuals and communities. Upcoming Undoing Racism® workshops in our community and nation-wide can be found here. invisible material considers collective practices and the workings of collectivity amidst current economies of individualism. The collective is often uplifted as an ideal, glorified potential model. But what are the operatives, and with this, the problematics of “collective:” collective thought, the collective unconscious, performance collectives, art collectives, and collective political organizing? What is it that we are needing right now that makes us want to be together, work together? What do we gain from working collectively, and what do we risk? We resist any assumptions of collectivism — its presence among us and its meaning. Who is disappeared, forgotten, silenced, unthanked in an image of a “new” collectivity? Can we resist “the Resistance”? We want to call out the fallacies of the post-45, all-American, sanitized, branded with a “capital-R” “Resistance”: “Resistance” that has been over-utilized, thrown around, dangerously capitalized on. How is a mainstream notion of collectivity being crafted from the work of those unthanked, and altered by and accredited to “the Resistance”? In light of this, we are curious about what collectivity really is, and really needs to be — in this contemporary moment. Can the collective be a collision? What is memory in this space of multiples — who is storying and who is listening? And can the listening be a story in and of itself? To claim the communal — how does sustainability come to the conversation when sustenance is understood as capital? Is lateral working a landscape of abundance? We ask: Can a performance festival challenge the capitalist, Western, and culturally white individualist structures in the performing arts that sees the artist as solo genius, and values “choreographer” over dancer? Can we make visible the ecosystem of labourers and resources that makes all our work possible? And can we highlight those who are already making invisible labour visible? We aim, as artist-curators, to connect, reflect, co-create, name, side-eye the fallacies, witness the magical, shine light on resilience, break solo-silos, and whisper back to our lineages, traceable and untraceable. To trust in our invisible material. *Capitalocene is noted as an epoch in which the humos, or human, becomes the individual proponent, or center, with unsustainable patterns of production and consumption on the planetary scale.